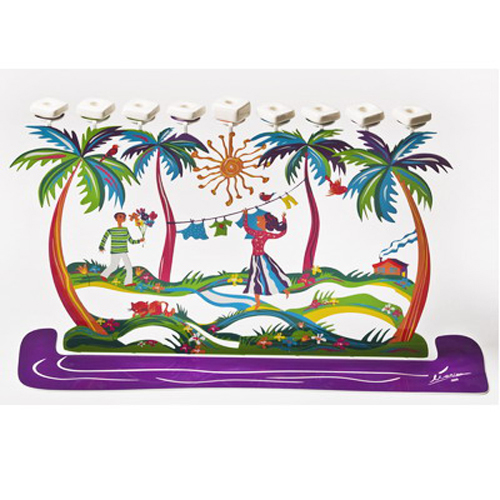 This Hanukkah menorah is fully functional and bears a colorful image of an outdoor scene in Israel featuring palm trees. Remarkably vivid, this Hanukiah is a great piece of modern Israeli Judaica, a great Hanukkah gift and the perfect home for your Hanukkah candles. Including candle holders made of polished Aluminum. The Jewish festival of Hanukkah (also spelled Hanuka or Hannukah), and known in Hebrew as Chanukah) boasts of many symbols: Dreidels (tops), potato latkes (pancakes), sufganiyot (jelly doughnuts) and Hanukkah gifts. However, the Hanukkah menorah (also spelled menora, and known as a Hanukiah, or Chanukia in Hebrew) is definitely the most famous and prominent of them all. Israeli artisan and sculptor Dan Shamir, a creator of top notch Israeli modern Judaica (ceremonial Jewish art), has applied his considerable talent to creating a menorah that is completely functional, as well as dazzling in style and design. Using the latest technology, metal is laser-cut in unique shape, and then silk-screen printed with a dazzling image. 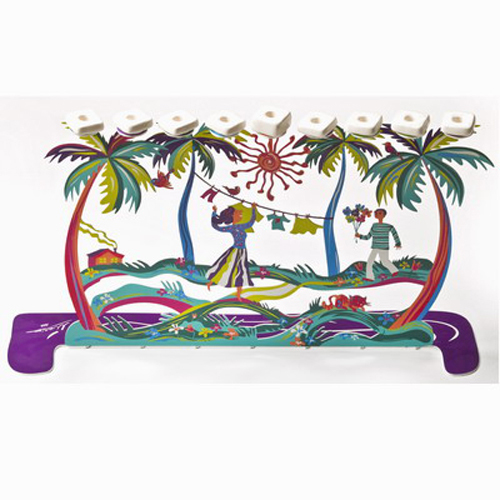 A vivid image of pastoral Israeli scenery is depicted: Palm trees swaying in the wind, a girl hanging laundry on a clothesline, a boy walking with flowers, animals, flowers and a lovely cottage. Ceramic candle-holders are lined along the top, to house the Hanukkah candles. This remarkable piece of Israeli art and modern Judaica is a must-have in any collection of beautiful, original Judaica. It’s the perfect Hanukkah gift, as well as gift on the occasion of a Bar/Bat mitzvah, graduation, anniversary or housewarming. Measures 50 x 14 x 28 cm, 20 x 5.6 x 11.2 inch.